Duck Run is for ducks and humans. The 113 acres that hold Duck Run Natural Cemetery are set in prosperous Virginia farmland in the beginnings of the Shenandoah River Valley, overlooked by the Alleghenies, Massanutten Peak, and the Blue Ridge Mountains. Duck Run is the brain child of Kenny Kyger, owner of Kyger Funeral Home, who approached the Rockingham County Board of Supervisors for permission to open a green burial cemetery after noting a trend in the funeral business. 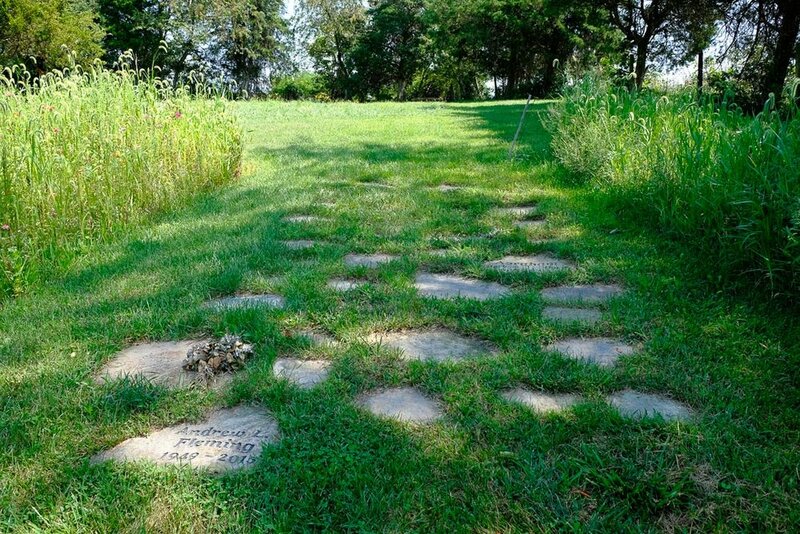 Duck Run is Virginia’s first natural cemetery certified by the Green Burial Council. Tom and I arrived along with the first guests for a memorial service, and we tried to be discrete in the open landscape. We walked along the edge past bee hives and cornfields to the top of a hill where a bench invited me to take in the breeze and meditate on the view of fallow fields covered in wildflowers beyond the cemetery. A path of stones on the slope below the bench memorializes people whose ashes are scattered in the meadows. In the distance the gathering produced sounds of laughter and the glad sight of children running in the sun. People in summer clothes hauled tubs of food from their vehicles. They gathered on the far shore of Duck Run's central feature--a large pond edged by cattails. Perhaps it was a watering hole for cattle when this was a broken down dairy farm, just old buildings and ruined foundations. Water makes a good rallying point for life--and death. We walked to the main buildings through an arbor where new grape vines are being trained. Everything planted here at Duck Run is edible, though sometimes this leads to tussles with the wildlife who also find it appealing. At the barn we found ducks gathered outside the front door waiting for Glenn Jennelle, Duck Run's general manager. Maintenance equipment fills the first floor but the loft is a sweet-smelling woodshop where biodegradable caskets suitable for natural burial will be built to sell through the funeral home. Glenn opened the loft doors and showed us how the property runs to the far corners of the corn fields. We peered down at the gathering of ducks. "I raised them so I guess I'm their mother," Glenn says. Glenn points out graves which are all but hidden in long grass. Kyger and Jennelle got the license to open a cemetery in 2012 and then spent two years figuring out just what they wanted. They didn't look at other burial grounds for fear of being tempted to copy before putting their own stamp on the place. One of their innovations is to offer both perpetual care lots and renewable lots, which revert back to the cemetery 75 years after burial. Most customers so far have not been locals. They come from Richmond, from Maryland and the coast. The people moving below our vantage point are here for a memorial service for a guy who was buried two weeks ago. It was sad, Glenn said, there were no mourners. He was 51. At least he's getting a party now. I remark on the river out of sight and Glenn sighs and breaks into my romance of the Shenandoah, taken from memories of the folk song "Oh Shenandoah" which I learned in elementary school. The river, he says, is incredibly polluted. DuPont released heavy metals in the 1930s and 40s from an upstream facility. Cows add to the problem with their manure and by stirring up contaminated sediment when they walk into the water. Yet the light, the sense of space magnified by the grandeur of the mountains, makes this a place one would want to be buried in. Newer PostI haven't marked my father's grave. Older PostUpdating the guide to reflect a growing green burial movement. Purchase The Natural Burial Cemetery Guide HERE. Sign up with your email address to receive new posts.